Grant Limone finished with 17 saves, and the Loyola University Maryland defense held off Boston University in the final quarter as the Greyhounds defeated the Terriers, 8-6, on Saturday afternoon in Patriot League play. With the win, 19th-ranked Loyola (7-6 overall, 5-2 Patriot League) clinched a spot in the League Championships. The Greyhounds jumped out to a 5-1 first-quarter lead, but Boston University (6-6, 3-4) dominated possession and pace-of-play in the second half, slowing drawing to within two goals. Loyola scored the second half’s first goal as Jack Carrigan picked up a ground ball, ran it into the box and fed Zack Sirico for a goal at 12:38, but the Greyhounds would not score for the remaining 27-plus minutes. Meanwhile, the Terriers scored the final three goals of the game, getting within two on Cal Dearth’s second of the half with 6:41 to go in regulation. 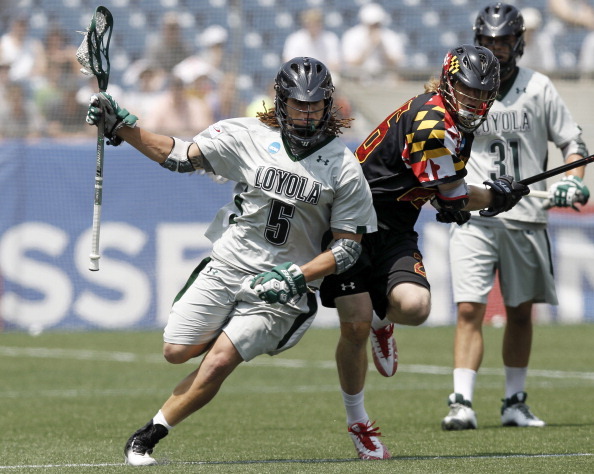 Loyola, however, did not allow them to draw closer as Limone made six of his saves in the fourth quarter. His total was one off his career-high of 18 set March 14 at the U.S. Military Academy. Boston University scored the game’s first goal after causing a turnover behind its own goal during a Loyola clear. Ryan Hilburn fed Jack Wilson on the crease after a quick restart, and the Terriers were up, 1-0, 69 seconds into play. Loyola, however, scored five in a row from that point forward. Tyler Albrecht recorded the Greyhounds’ first two goals, creating for himself off dodges at 11:28 and 9:42. Brian Sherlock added a man-up goal off a Romar Dennis assist 1:21 later, pushing the lead to four. Zach Herreweyers scored two goals 11 seconds apart late in the quarter to made the lead, 5-1. His first came with two slick moves to get free toward the crease, and he then picked up a ground ball off a off-cage Jay Drapeau shot off the ensuing faceoff to score his second. Boston University cut its deficit to 5-3 midway through the second quarter on goals by Adam Schaal and Greg Farris. Loyola, however, came back with Herreweyer’s third of the game at 3:51. Sherlock sent the ball to Herreweyers on the low right side, and he put a fast grounder past Boston University’s Christian Carson-Bannister. Drapeau then added a goal with just over 10 seconds left. Johnny Guiffreda created space with a roll dodge behind the crease and crossed to a waiting Drapeau for the score that sent the teams to the locker room with Loyola in front, 7-3. Carrigan’s feed to Sirico, however, was the last goal for the Greyhounds as Boston University won all six second-half faceoffs and controlled possession. Loyola had 12 shots after halftime and only two in the fourth quarter. The Terriers, meanwhile, squeezed off 30 second-half attempts and outshot Loyola, 50-37, overall. A pair of unassisted Dearth goals bookended a Hilburn extra-man goal, which was fed by Dearth, to provide the Terriers’ second-half scoring. Limone, however, came up big in goal for the Greyhounds, surrendering just six goals. He made six saves in the fourth quarter, including a one-on-one attempt by Dearth from the right side with less than five minutes to play. He also cleanly saved another Dearth attempt with under a minute to go, allowing Loyola to clear and run out the clock.